FAYETTEVILLE, Ark. 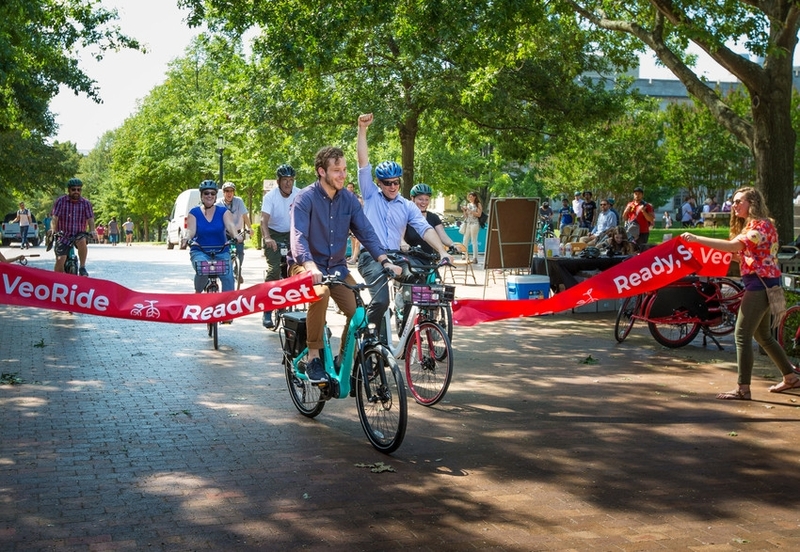 – The University of Arkansas and City of Fayetteville welcomed the VeoRide bike sharing program in a launch event Wednesday morning at the Fulbright Peace Fountain on campus. Chancellor Joe Steinmetz and Mayor Lioneld Jordan were on hand to promote the program and encourage people to bicycle for fun, for their health and for the environment. VeoRide is a dockless bike sharing system using geo-fencing technology which helps riders find a bike, reserve, unlock and ride it, then find a place to park it. Other technology systems will help the local VeoRide team maintain the fleet, resolve customer issues, and provide data to improve the program. While most bike share programs require use of smartphone apps and credit cards, VeoRide’s system offers alternatives. Check their website for details. The Fayetteville program is the largest to-date for VeoRide with 340 custom bikes, including 290 standard 7-speed bicycles and 50 electric motor assisted “e-bikes.” Most of the bikes are cream and Razorback red with logos of the city, university and Experience Fayetteville. The e-bikes are teal. Bicycles will be available for pickup on campus, in and around the downtown area, along city trails and at other locations within the area the bikes can operate. Users can use the app to see a map that shows exactly where available bikes are located. U of A students, faculty and staff can pay $10 monthly or $35 per year for a subscription. Subscribers will receive unlimited one-hour rides. Overage fees will be 50 cents for every 15 additional minutes. Riders will have to supply their own helmets. Chancellor Steinmetz said it is worth the effort.